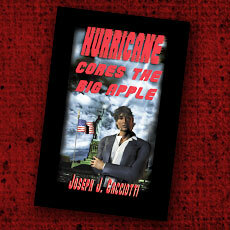 Meet Samuel James Rufus aka HURRICANE, the son of a Shoshone mother and a career military/lawman Italian father. From his beginning on a Nevada Indian reservation Sam was physically and mentally agile, but as a teenager in New York he got in trouble with the law that forced him to decide his own fate. After six years in the United States Army that included an unprecedented rise as a Green Beret, he joins forces with the detective squad in New York. Just when he thought his days of fighting were over, he is called upon to help out two friends from his past. Now he must return to the fierceness he once knew in the army: an eye for an eye a life for a life. $14.25 including shipping & handling for USA only.